Go-Ahead Bus Service 17A is a Short-Trip Service variant of Bus Service 17. 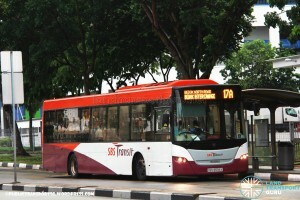 The route operates from Bedok Bus Interchange and ends at Bedok North Ave 4 (SBST Bedok Nth Depot), operating as a full-day service. 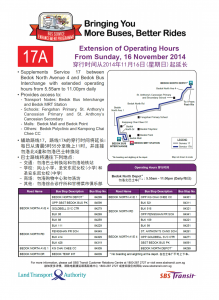 Service 17A is a shortworking trip of Service 17, originally helping to ease high demand for its parent service between Bedok North Avenue 4 and Bedok Interchange. 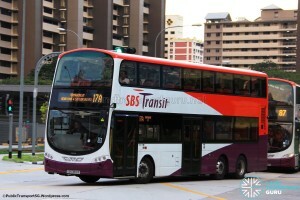 Operating out of SBS Transit’s Bedok North Bus Depot and looping at Bedok Interchange, it operated only during weekday AM and PM Peak hours, adding extra capacity to Service 17’s residential sectors within the Bedok estate. 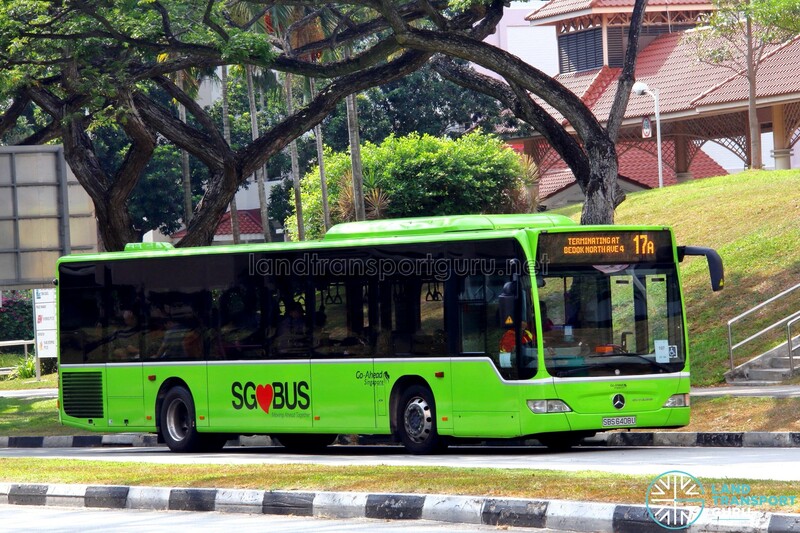 From 16 November 2014, Service 17A was converted into a full-day service under the Bus Service Enhancement Programme (BSEP), with additional BSEP buses supplemented but no change in route. This was the third time that an extension of service hours has been classified under the BSEP, after Service 63M and 859A. The extension of operating hours improved connectivity for residents in the Bedok North area to Bedok Bus Interchange and Bedok MRT Station. Access to amenities such as Bedok Polyclinic and Kampong Chai Chee CC, and schools such as Fengshan Primary, St. Anthony Canossian Primary and St. Anthony’s Canossian Secondary was improved. As a route variant of Service 17, this service is wheelchair-accessible as of introduction. 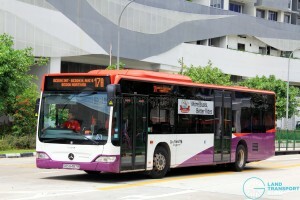 However, SBS Transit only officially declared the BSEP enhanced Service 17A to be wheelchair accessible from 03 December 2014, which meant that between 16 November 2014 – 03 December 2014, the service was technically non-wheelchair-accessible. As an interesting fact, the route is also a duplication of Feeder service 227 (Bedok Int – Bedok North Depot (Loop)), which was withdrawn in 2002. With Go-Ahead taking over Service 17A from 18 September 2016, Service 17A was re-defined to start from Bedok Interchange and terminate at Bedok North Ave 4 (SBST Bedok Nth Depot). In practice, however, there is no change in service levels. From Bedok North Avenue 4 → Bedok Int, buses will operate as Service 17. 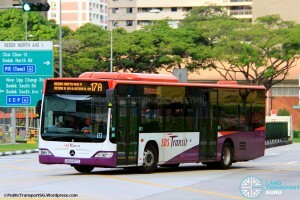 Service 17A now tuns around at Changi South Lane. Fare: Charges fares for regular trunk services. See Bus Fares for exact fares. 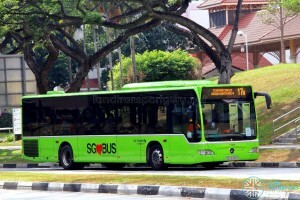 The Bus Service Operating License (BSOL) for this route will be renewed in 2021 under the Loyang Bus Package. 2011 (25 Apr): Enhanced frequency between 0800hrs – 0830hrs. 2014 (03 Dec): BSEP Route variant officially declared wheelchair accessible (WAB). 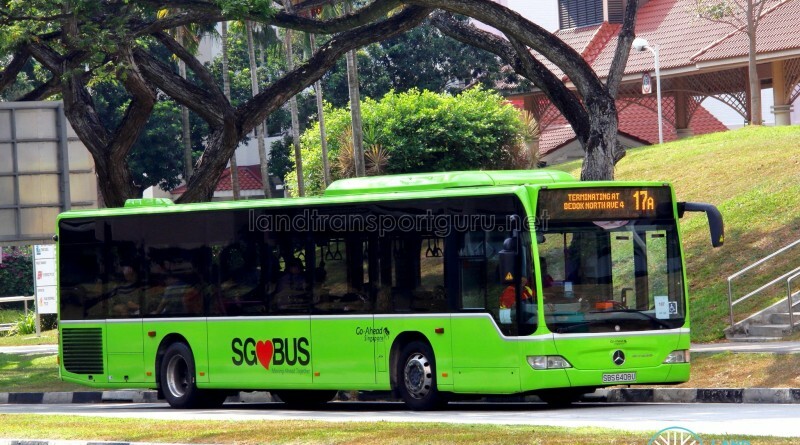 2016 (18 Sep): Operations transferred to Go Ahead Loyang Pte Ltd from SBS Transit Ltd. Routing amended to Bedok Interchange → Bedok North Avenue 4 (SBST Bedok Bus Park). No longer starts / terminates inside SBST Bedok North Bus Depot.